Emelia Mason has spent her career finding the dirt on the rich and famous. But deep down past this fearless tabloid-reporter façade, there's a nerdy Narnia-obsessed girl who still can't resist climbing into wardrobes to check for the magical land on the other side. When a story she writes produces tragic results, she flees to Oxford, England-home to C.S. Lewis-to try and make amends for the damage she has caused. Peter Carlisle was on his way to become one of Great Britain's best rowers-until he injured his shoulder and lost his chance at glory. He's determined to fight his way back to the top even if it means risking permanent disability to do so. It's the only way he can find his way past failing the one person who never stopped believing in his Olympic dream. Customer Reviews For "Can't Help Falling"
As I've come to expect from this author, this book was an absolute delight to read! The characters and their circumstances are so relatable that it's almost impossible not to get caught up in their journey. Such a sweet romance but also such depth as they worked through - sometimes apart, sometimes together - the challenges in their lives. Such beautiful themes of love, faith, forgiveness and hope amidst the heartache found in so many lives. Loved all the references to Narnia and other literary works too. An incredible story, beautifully written. Very much looking forward to more books by this author. I loved this from the very first page. This one is written for Narnia fans as it is set in Oxford, England and both of the main characters absolutely love the Narnia books so quote from them often. Although it is a romance with lots of funny moments there is still a depth to the story. I love the journey to faith that Emelia takes. This book follows on from Kara's first book, Close To You, although you don't have to have read the first book, it is great to meet the characters again and continue their journey too. I was a bit disappointed that this novel was not set in New Zealand, and that the main characters are not even from the southern hemisphere. (However, the characters from Kara Isaac's first novel 'Close to You' do appear in this one, which a lovely conclusion to their story). While I enjoyed the novel, I did find it hard to stay engaged with 'Can't Help Falling', and the reason was that I just could not relate to the main characters. Emilia is a tabloid reporter whose job inadvertantly contributed to a tragedy, while Peter is a wealthy, upper class olympian hopeful - neither exactly the kind of people I hang out with on a daily basis! So the story never quite seemed real to me. However, I still enjoy Kara Isaac's writing style, and hope she write some more novels soon! With 3 books, Kara has established herself as an author to watch. First, it is wonderful to have a Kiwi writing books about (so far) NZ, England and now Australia. Second, her books have plenty of depth and real characters that we can relate to. I generally avoid 'romance' but Kara but the reviews were so positive, I overcame my prejudice. It was worth it. The books are fun with multiple hidden plot lines to be worked out. I particularly liked the fact that this had some stronger Christian elements. I'll keep my eye open for her books in the future and hoping for some more Kiwi stories. As a keen Narnia and Lord of the Rings fan - those elements in both of her first books also added to my pleasure. Get your hands on this story, friends! 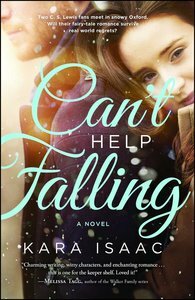 Can't Help Falling's happily ever after is a given, but unlike many in this genre, Isaac takes her characters on an authentic and challenging journey towards love, that is as savvy as it is whimsical. Isaac's dialogue is excellent, so much so I felt I was hearing the characters speak, rather than just reading their words. Peter and Emelia are intelligently written, appealing as much for their differences to the standard romantic protagonists, as their familiarity. Isaac tackles significant issues in this story giving the story greater substance than a lighthearted romance, while retaining charm and plenty of sharp wit throughout. England's Oxford, Narnia, and uniquely British traditions are incorporated beautifully into the story, with a fascinating peek into the life of an elite rower. Isaac's debut novel garnered rave reviews - mine included - but she has topped it with Can't Help Falling, deftly including Close to You's Jackson and Allison as significant characters. If you love Denise Hunter, Melissa Tagg, Beth Vogt, and Carla Laureano, Kara Isaac is your girl!